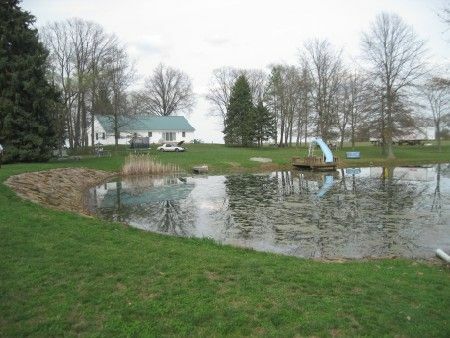 3 Bedroom 3 Bath Ranch with MASSAVE Garage and Pond. Enjoy the outdoors on the large covered concrete floor front porch, relax on the rear patio or on the deck back at the pond. Live in the country and be just minutes from town. The ranch is desiged with a large open concept living room and dining room; eat-in kitchen with beautiful cabinetry and tile floor; foyer offers a double closet; den; owner's suite has his and hers closets, clothes drop shoot to basement laundry, additional walk-in closet, attached full bath with shower-tub and tile floor; another bedroom with closet; full bath with shower over tub and tile floor; utility room; pantry; 9' ceiling, concrete floor basement with outside access door; full bath; bedroom with closet; utility room and storage room. Another great feature of this property is the 6 car, concrete floor garage with insulated and drywalled interior plus standing seam metal roof. All situatted on approximately 4 acres. The slide and the mirrors do not stay with the home. Enjoy the outdoors on the large covered concrete floor front porch, relax on the rear patio or on the deck back at the pond. Live in the country and be just minutes from town. The ranch is desiged with a large open concept living room and dining room; eat-in kitchen with beautiful cabinetry and tile floor; foyer offers a double closet; den; owner's suite has his and hers closets, clothes drop shoot to basement laundry, additional walk-in closet, attached full bath with shower-tub and tile floor; another bedroom with closet; full bath with shower over tub and tile floor; utility room; pantry; 9' ceiling, concrete floor basement with outside access door; full bath; bedroom with closet; utility room and storage room. 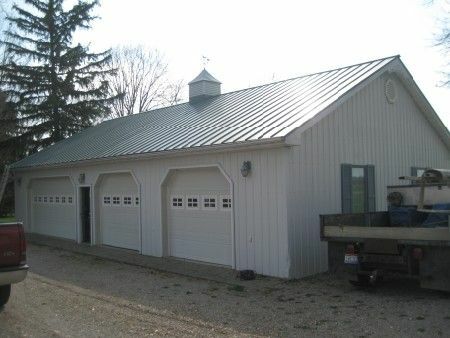 Another great feature of this property is the massive concrete floor garage with insulated and drywalled interior plus standing seam metal roof. All situatted on approximately 4 acres. The slide and the mirrors do not stay with the home. Real Estate Terms: As Agents for Jennifer S. Henkle and the late Daniel L. Henkle, pursuant to Ross Co. Common Pleas Court Case No. 09DR060, we will auction the real estate on the premises. Being sold at Absolute Auction, No Minimums or Reserves; $7,000 down at time of sale by cash or check w/photo ID; balance & possession at closing on/before April 23, 2013; taxes prorated to closing date; no warranties or guarantees given, expressed or implied. All information provided is to be utilized only as a guide. Buyers are responsible to conduct any inspection, inquiry, investigations and due diligence regarding to property. Buyer agrees and understands that the seller makes no warranties or representations of any kind either expressed or implied as to the condition, quality, and merchant ability of fitness for a particular purpose of the real estate or any part thereof and/or serviceability for the same. Buyer is buying property subject to any and all easements, leases, covenants and restrictions. The agreement of auction is solely between buyer & seller. Stanley & Son, Inc. and its agents are exclusive agents of the seller. Any announcements made only by the auctioneer from the podium during the time of auction will take precedence over any previously printed material and/or any other oral statements made or implied. No liability exists regarding the information contained in any printed matter for its accuracy, errors or omissions. Bidding is open, just call out, raise your hand or watch the ring personnel…they will assist you and try to get answers to any questions you may have prior to bidding. Statute of Limitations: Any action or suit of any kind must be commenced within one year from the date when the cause of action or suit occurred or it will be forever barred. The Right of Action or suit will begin to run on the date of breach, damage or injury is sustained & not when the resulting cost, damage, harm or loss is discovered. This Agreement will be exclusively construed & governed in accordance with the laws of the State of Ohio, without regard to its conflict of Laws Principles. The exclusive jurisdiction & venue for any controversy or claim between the parties shall be the State of Ohio, County of Ross, City of Chillicothe, by binding arbitration.